The official language of this live educational conference will be English. Simultaneous translation from English into Spanish will be provided in plenary room. endocrinologists and internists managing diabetes and cardiometabolic diseases in the Latin American region. 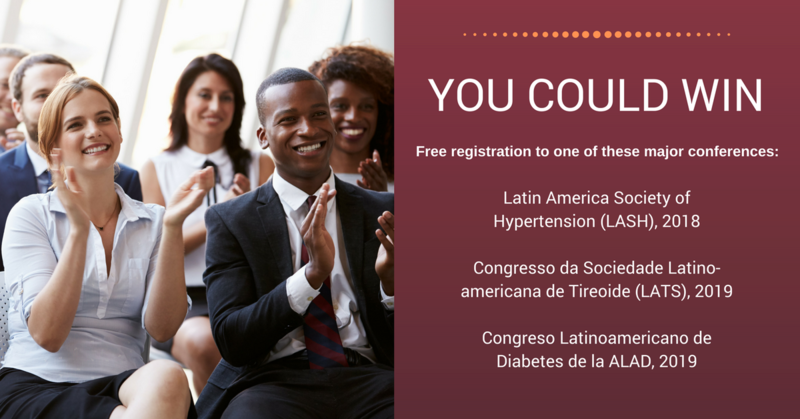 Participants registered for this conference: complete the pre-event, post-event and follow-up surveys and you will be entered into a draw to win free registration to a major conference in Latin America. Check your email for the survey invitation. Diabetes is one of the largest and most alarming health emergencies of the 21st century, affecting over 400 million people worldwide. Managing patients with diabetes and pre-diabetes is a challenge when considering the pathophysiologicaly complex pathways underlying glucose metabolism disorders. Deep knowledge of pharmacological mechanisms allows for effective prevention strategies for diabetes among those with impaired fasting glucose (IFG) and impaired glucose tolerance (IGT) and effective management of patients with overt diabetes. Thyroid disorders are among the most prevalent endocrine diseases, with significant impact on quality of life and increased risk of morbidity. Thyroid hormones regulate the homeostasis of various tissues and thyroid diseases should be adequately treated to avoid adverse clinical outcomes. According to the World Health Organization, high blood pressure (hypertension) is the highest risk factor for premature mortality. Worldwide, hypertension causes an estimated 7.5 million deaths per year and is a major risk factor for invalidating or lethal events including ischaemic and haemorrhagic stroke, coronary heart disease, heart failure and renal impairment. Taken together, hypertension and diabetes share common pathophysiologic mechanisms, health outcomes and clinical issues that are often tough tasks to face in clinical practice. This EXCEMED live educational will address cutting edge research advancements in the areas of cardiometabolic medicine and will discuss the daily clinical approaches to the complex cardiometabolic patient. L.A. Bortolotto (Brazil): Heart rate as a target in the treatment of hypertensive patients: Fact or fancy? Expert Interview: L.A. Bortolotto (Brazil) - Heart rate as a target in the treatment of hypertensive patients: Fact or fancy? Heart rate as a target in the treatment of hypertensive patients: fact or fancy?